Easter Break for Students- April 18th-22nd Let's Finish Strong Pirates!!! Ms. Charlene Stephens of Pass Christian, Mississippi was recently chosen as Pass Christian School District Teacher of the Year for the 2018-2019 school year. Ms. Stephens, a veteran teacher with sixteen years’ experience, currently teaches sixth grade social studies at Pass Christian Middle School. She is recognized as a teacher who always goes above and beyond to show her students how much she cares, not only about their education, but about their futures and roles in society. She encourages students to be actively involved in their own learning, designing lessons that challenge and actively engage her students including making history come alive by inviting veterans into her classroom to give firsthand accounts of their experiences. She continually serves as a role model in the community, running food drives for the community food bank, and collecting Christmas presents and organizing caroling for residents at the local nursing home. Under her guidance, her students have advanced to the state geography bee, become finalists in the Patriot’s Pen Competition, and earned numerous achievement awards. Undoubtedly, her greatest contribution and accomplishment while teaching is the strong sense of patriotism she instills in her students. Every day she immerses her students in a culture of respect, integrity, and responsibility. Stephens attended the University of Southern Mississippi where she obtained her Bachelors of Science degree then later earning her Masters of Education at William Carey University. She is currently working on her Specialist in Educational Leadership and is expected to graduate in February 2019. Ms. Stephens continually works to provide leadership to both her students and coworkers serving on numerous teams and committees as well as acting as a mentor teacher for first year teachers and facilitating the district’s New Teacher Induction program. She has been honored with Teacher of the Year Awards for Pass Christian Middle School in 2013 and 2018. She was the VFW District 1 Teacher of the Year as well as the Cecil R. Ruddock VFW Teacher of the year in 2017. In 2015, Ms. Stephens was awarded the Governor’s Award at the PREPS-MAPE Conference in 2015. 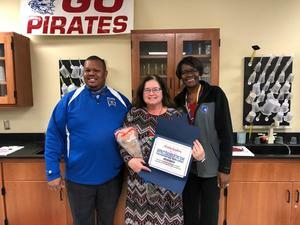 Students of Pass Christian Middle School continue to show their love and respect towards Ms. Stephens as she has been awarded Teacher of the Month fifteen times between the years of 2005 and 2018. Ms. Stephens’ contributions to Pass Christian will leave a legacy for the generations that follow.